When traveling by bus, one can buy tickets ahead of time. A student ID entitles the holder to a discount of 50%. One may also buy a ticket on the bus; however, drivers are not able to make change for large bills. Since buses vary in construction, either passengers enter in the front and exit in the back or vice versa. 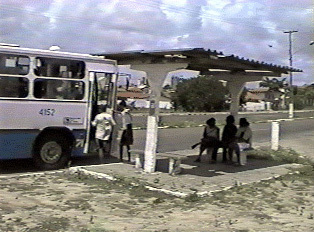 A passenger enters the bus, hands the driver a ticket or cash, then passes through the turnstile. All buses are marked on the side and front with the number of the bus route, and its first, middle and final destination. To signal an approaching exit, simply pull the wire or push the button to alert the driver. It is always permissible to ask those waiting at bus stops for help in finding the correct bus. Luggage or groceries can be brought on board. All passengers, even those going to the beach, must wear shirts when riding the bus. "Asking About Public Transportation (in the south)"
"How to Pay for the Bus? (in the south)"
"Can you please stop at the next stop?" Por favor, pare na próxima parada? "Where is the nearest bus stop?" Onde é a parada de ônibus mais próxima?